"You, Too, Can Be a Super-Artist!" "The Name of the Game is Superman!" On an average day at the Daily Planet, a young man named Tony Van Dyck was sitting in the waiting�office of the Planet's Comics Editor Tim Forbes about a job as a cartoonist. Lois told Clark that earlier that day�Forbes called in sick, so maybe one of them should see Tony. Clark�decided to do it and agreed to take a look at the young man's work. Tony presented him with a comic strip he had drawn and written about a super-powered ape called "Super-Ape". Clark thought the writing was fairly well done, but the artwork, which looked about 4th-grade level,�was, in Clark's words "Nowheresville".�When�Clark asked about his art background, the boy pulled out his diploma from E.M.M. (Every Man a Michelangelo) Art School. Clark told Tony that the Planet would hold onto his art for Tim Forbes to look over when he returned, which was very encouraging to Tony, but Clark had other thoughts. He decided that he needed to see if this boy�was just one person who refused to accept no as an answer, or�was this E.M.M. school�a fly-by-night�operation, in business just to make money by collecting tuitions and passing out phony diplomas. So�Clark submitted his own application to the school, using his left hand to deliberately create the worst drawing he could. Sure enough, he receives an acceptance letter praising�his art�and asking for $50 up front as a down-payment on a 6-month course. Clark changed to Superman and flew across Metropolis to the location of the art school. Using his x-ray vision and super-hearing, he sees and hears the two men in charge, in their office,�stockpiling the money from tuitions and talking about what a great racket they have. Showing up at the school for some in-person lessons, Clark was given a smock and beret and directed with the other students�to copy a portrait of Superman. Instead, he uses his x-ray vision to create a self-portrait�of�himself. Clark's personal instructor, Professor�Da Fony saw the finished product and declared the work to be "...an unbelievably faithful image of yourself, Mr. Kent. Sheer Genius!" The professor calls over the school's�director to see the work and he decides to move Clark to an advanced painting class immediately!�Clark thought "they're taking the bait faster than I thought". They ask Clark to do a copy of the Mona Lisa copy they have in the class, but Clark uses his telescopic vision to see all the way to the Louvre Museum in Paris and copy the real Mona Lisa. Da Fony and the school heads are�impressed by how much it looks like the original, as if Da Vinci had done it himself. Clark was then�offered a private studio and directed to reproduce Gainsborough's "Blue Boy" and Rembrandt's "Night Watch." Clark meekly says "I'll try, but no written Guarantees!" Clark, deciding that�"There are certain secrets I�must know...that only the artists themselves can tell me! ", changed to Superman and travels back in time. He first decided to go see Gainsborough, but while flying back through the timestream, was caught in a cosmic whirlpool and pushed through the tail of Haley's Comet. The resulting effect made him younger and turned his skin color�pale blue. He ends up on the same block where Thomas Gainsborough lives, who seeing him, invites him in, and is then inspired to paint "Blue Boy". After painting the entire picture (except the face), he tells Superboy "I cannot use YOUR features, who would believe an all Blue Boy?" Superman returned to the timestream and�on to the year 1682 to visit Rembrandt. Once again, he runs into Haley's Comet and, passing this time through the entire spectrum of its�tail, Superman douses himself in all the other colors minus�blue, turning his skin back�to its normal appearance and returning him to full adult size.�Rembrandt saw Superman and, because of his physique, decided he'd be a perfect model for his "Night Watch" painting. He asked Superman to put on a guard's uniform, and Superman says, "I'll work for nothing if I can just see your manner of painting." After he was done as a model,�he was surprised to see that the face in the painting was not his. Rembrandt replies "Are you paying the guilders this officer of the Night Guard did to have HIS portrait included?" With that, Superman returns to the 20th century. Back at the art school, Clark paints copies of "Night Watch" and "Blue Boy". The school's two heads declare them to be perfect copies and formulate a plan. The plan was fairly elaborate. They were in contact with a wealthy and unscrupulous art collector, who they led to believe that they had possession of the real paintings, along with�the Mona Lisa,�and that the museums the real paintings had been�in, now had very clever forgeries.�In truth,�what they were actually�selling were Clark's three�forgeries. They told the art collector that the museum curators believed that robbery attempts were foiled and the museums�still had the originals. At that moment, Clark came in with the police right behind him, and announced that these 3�paintings were the actual forgeries. The head of the school protested that the Mona Lisa had Da Vinci's signature. Clark pointed out that Da Vinci NEVER SIGNED his paintings. On top of that, a closer look at the Night Watch painting showed a Bongo drum instead of�a military drum, and in the Blue Boy painting, his hat was in the wrong hand. Clark directs the police to convict these men and get the tuition money back to the rightful owners.�Later at the Daily Planet, Clark informs a very happy�Tony Van Dyck that he will be hired as the writer of the "Super-Ape" strip and they will get a professional artist for the art work. Story - 3: This story in a way is actually two stories. There's the main�story about "Action Reporter" Clark Kent doing an undercover story to expose a phony art school that's ripping off prospective art students. Then there's a side�story about time travel, which wasn't an�uncommon plot device�in the silver age. If you took the time travel element out of the story, the rest could have�come together fairly neatly as a nice little story about�the clever way that Clark exposes�the school. The time travel insert has a�few plot holes. #1 - The very reason Clark goes back is because of some secrets of the artists that only they could tell him. Well... what were those secrets? The fact that Superman actually posed for both pictures seems unlikely to me to be what he wanted to know. I interpreted the�word�"secrets" to possibly�mean keys to their unique�style and method�of art. #2 - Gainsborough. He�can paint a perfect representation of period clothing when his model is actually wearing�a costume�and a cape, and he can add a�realistic�background purely from memory, but it's totally beyond him to substitute flesh�color for light blue when painting his model's face? #3 - How many times in the silver age did�Superman ever time travel back and forth to the past and back, and when did going through Haley's Comet ever cause a change in size and skin color?�In this case these seem like a stretch just to add something to make the story about more than just�one of the many times Clark could do his reporter�job without being Superman.�On top of that, plot hole #4 at story's end�could possibly be, what crime exactly does the art school staff get charged with?�It's not a crime to sell copies of famous pictures,�any real art expert would have seen these three�were fakes, and Clark admitted to the police the he was the painter of the phonies. Art - 3: Nothing particularly wrong with the art, I just have never been a fan of the pencil work of Ross Andru. Somehow it just looked like work that belonged in Marvel Comics.�Any time I read a story that he's done, if it's a Superman story, I�feel like�I'd rather see how Curt Swan would have done it. If it was a Flash story, I'd rather have seen how Carmine Infantino might have done it. The only time I was satisfied with his art was in the 1976 DC/Marvel crossover "Superman and The Amazing Spider-man". On another�average day at the Daily Planet, an elderly man named Homer Ferret came into Clark Kent's office promising him�a Pulitzer Prize for�"the dad-burnedest headline this paper ever put out!...It's a scoop that's gonna scoop Superman!" Clark was skeptical, but Perry White was close by and believed that they should hear what he had to say, since he refused to speak to anyone else. It turned out that�Ferret was from Smallville and to get the story, they had to�return�there to Ferret's ancestral home. Ferret took Clark to a room in his house�called the "Superman Chamber". Inside the room were statues and mementos dedicated to events in the past�that Superboy or Superman had done. Clark commented that it was some collection, but hardly the scoop of the century. Ferret then answered�"sit down here and I'll explain". 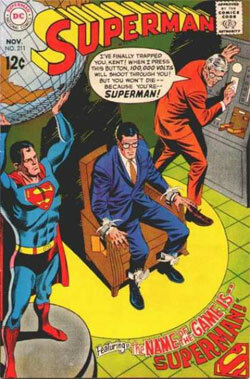 No sooner did Clark sit down in the chair, then wrist restraints popped out and clamped his arms down. It was at that point that Homer Ferret got to the real point of what he wanted to tell Clark, saying "Listen Mr. Kent, or should I say Superman?" Homer Ferret was a longtime resident of Smallville. He was there when Clark as a little boy,�stopped a runaway railroad car�from running into Smallville Station. He recounted the time when a fire broke out at the High School, and he saw Clark run behind some bushes and a second later Superboy shows up and put out the fire.�Clark protested that all Ferret had proven was that Clark and Superboy once lived in the same town. Ferret had an answer for that. One day he came up behind young�Clark and accidentally (on purpose) bumped into him, knocking his glasses into Ferret's hand.�Ferret had worked as an optometrist, the only one in Smallville.�The first thing he noticed was that the lens were not even made of real glass.�Ferret challenges the captive Clark to explain the phony glasses. Thinking fast, Clark says, "Er...you know I've always been timid, sir! Not many boys would take a poke at a kid who wore glasses!" With that response, Homer comes straight to the reason for getting Clark there, he wants an admission. He told�Clark the chair was wired to�a generator that can deliver 100,000 volts,�He says, "This could send any man on a one-way trip to dreamland... unless he's SUPERMAN!" Homer Ferret then announced that he was starting a 10-second countdown, Clark had 10 seconds to decide what to do. In that time he has several thoughts. "If I don't go up in a puff of smoke, he'll know I'm Superman, but... if I bust out of these wrist clamps, that's a dead giveaway, too." As the countdown reaches "2," it dawns on Clark "He may be a little loose between the ears - but he's no killer. He wouldn't risk a man's life if there's a possibility that he's wrong." So when the count reached zero, Clark started to laugh, telling Ferret to turn the current off because it tickles. Ferret then comes clean and admitted�that the�generator was only wired to send a few volts. Clark had already figured that out, having used his x-ray vision to see the dynamo under the floor. Ferret makes his apologies: "There's your headline: Old Man Makes A Fool of Himself!" Clark is willing to let bygones be bygones and tells Ferret that he'll keep the secret, and that his Superman souvenir collection is worthy of a story. Later, Clark visits an optometrist to get a new pair of glasses with real lens. Story - 2: This story is not long, it's also not very believable. For starters, Homer Ferret was never believable at any point in the story that he was capable of killing. He didn't look like a killer, and as the story unfolded, he didn't seem like one. It also seems�like Ferret gave up pretty�quickly for�someone who's spent�so many years, and probably a�fair amount of money�pursuing the conviction that Clark is Superman, and buying trophies of his exploits. Superman does not even make an appearance in this story (unless you count the statues in Ferret's trophy room). I guess I'm also wondering, at the end of the story when Clark goes to the eye doctor for new glasses, isn't almost any self respecting optometrist going to want to inspect the original pair, AND do an eye exam? How does Clark handle that one? Sadly, we will never know, but I suspect it might have made as interesting a story as this one was. Art - 5: The story maybe didn't move me but the art certainly did. I always like a good Swan-drawn story, but some of my favorite is when he's inked by Jack Abel. From what I can find, Curt and Jack only worked together for about a two year period between 1968-69, but to me, in both style and effect it surpasses his work�with other inkers up to that point in time. As an all Clark Kent story, readers get several great shots of Clark with different expressions, and Ferret is an interesting character study too in the way Swan could do facial features. Cover Art - 4: Not much to complain about here, the exception being that, on the cover,�Homer Ferret looks more like he's capable of killing�then he looks at ANY point in the story.